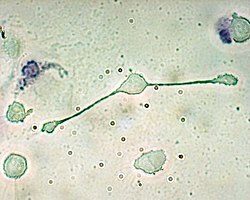 A Macrophage stretching its "arms" (pseudopodia) to engulf two particles, possibly pathogens, in a mouse. Trypan Blue Exclusion. ^ Hulsmans M, Clauss S, Xiao L, Aguirre AD, King KR, Hanley A, et al. (April 2017). "Macrophages Facilitate Electrical Conduction in the Heart". Cell. 169 (3): 510–522.e20. doi:10.1016/j.cell.2017.03.050. PMC 5474950. PMID 28431249. ^ a b c Sabine A. Eming1, Thomas Krieg and Jeffrey M. Davidson (2007). "Inflammation in Wound Repair: Molecular and Cellular Mechanisms" (PDF). come.mx. Archived from the original (PDF) on 1 July 2014. Retrieved 2013-08-17. Monocytes/macrophages. Unless stimuli for neutrophil recruitment persist at the wound site, the neutrophil infiltration ceases after few days, and expended neutrophils are themselves phagocytosed by macrophages, which are present at the wound side within 2 days after injury. ^ Goto H, das Graças Prianti M (2009). "Immunoactivation and immunopathogeny during active visceral leishmaniasis". Revista do Instituto de Medicina Tropical de Sao Paulo. 51 (5): 241–6. doi:10.1590/s0036-46652009000500002. PMID 19893975. ^ "The lymphocyte story". New Scientist (1605). Retrieved 2007-09-13. ^ MISHIMA, YUTAKA (October 1967). "Lysosomes in Melanin Phagocytosis and Synthesis". Nature. 216 (5110): 67. Bibcode:1967Natur.216...67M. doi:10.1038/216067a0. ISSN 0028-0836. PMID 6050674. ^ Kühl AA, Erben U, Kredel LI, Siegmund B (2015-12-07). "Diversity of Intestinal Macrophages in Inflammatory Bowel Diseases". Frontiers in Immunology. 6: 613. doi:10.3389/fimmu.2015.00613. PMC 4670857. PMID 26697009.